The four-story building will cover approximately 440,000 sq. 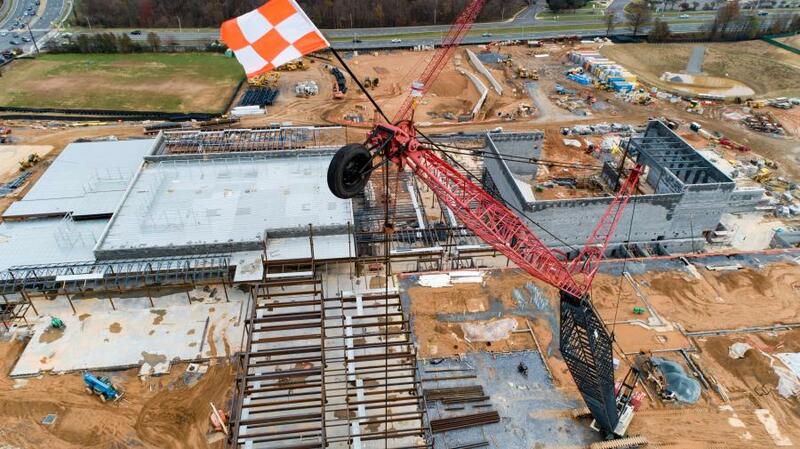 ft. and will serve as the new Seneca Valley High School in Germantown, Montgomery County. 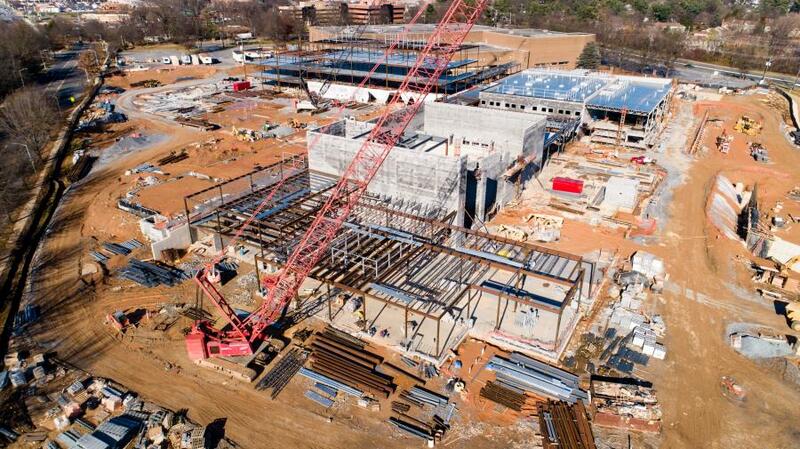 The school is expected to be ready for the start of the 2020/2021 school year and will have the capacity for more than 3,000 students. Ground was broken in September 2017 and completion is set for August 2020. The following year, the current facility will be demolished and the grounds will be completed. Construction of the new building is taking place on the school's old athletic fields. 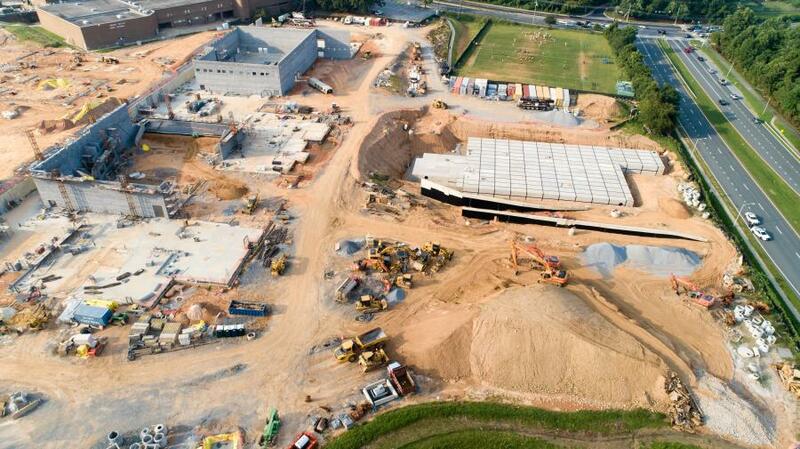 Upon completion of the new building, the new athletic fields will be built where the current building stands today. 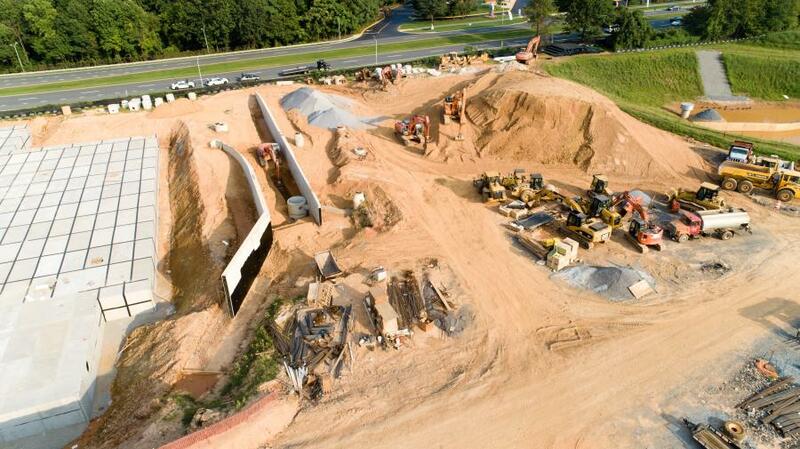 The contract for construction management was awarded to Dustin Construction, Ijamsville, Md. Funding for the project is part of the Montgomery County Public Schools (MCPS) Capital Improvement budget, as reported by Derek Turner, director of the Department of Communications for MCPS. The project was reportedly divided into in three phases, over the course of four years, including existing utility relocation; the new building, adjacent parking lots and stadium; and demolition, parking lot and field completion. Marc J. Cohen, has been principal of Seneca Valley since 2010. Prior to that, he served as principal of Martin Luther King, Jr. Middle School — a SVHS feeder school — for four years. "Our community has been asking for a new school for many years now," he said. "This state-of-the-art facility will revitalize and inspire for decades to come." Seneca Valley High School opened in 1974 with 251,278 sq. ft. on 29.4 acres. Montgomery County has 206 schools: 134 elementary schools, 40 middle schools, 25 high schools, one career and technology center, five special schools and one alternate education program. According to the school website, Seneca Valley is the home of the Screaming Eagles and is "a highly engaged, diverse teaching and learning community." The school features an International Baccalaureate (IB) program that challenges students to consider the importance of communication, cultural awareness and connections between school life and the world around them. It also has a nationally recognized wall-to-wall academy program that includes Academies of Human Services, Business and Finance, Arts and Media and Science and Technology. The purpose of this project is to revitalize/expand the high school. Based on the condition of the existing facility and the cost to bring the school into compliance with code requirements, the most cost-effective solution was to construct a replacement facility adjacent to the existing school. The capacity of the school will increase from 1,374 students to 2,423 students with a core capacity for 2,400 students. The increased capacity to Seneca Valley High School provides the opportunity to address projected overutilization of nearby Clarksburg and Northwest high schools through student reassignments in the future. According to MCPS documents, the preliminary plans for the Seneca Valley High School revitalization/expansion project were developed based on the educational specifications prepared by MCPS. Through a series of public meetings, several design alternatives were developed and evaluated. The proposed plans were reviewed and subsequently modified in accordance with recommendations and suggestions received during the schematic design meetings. 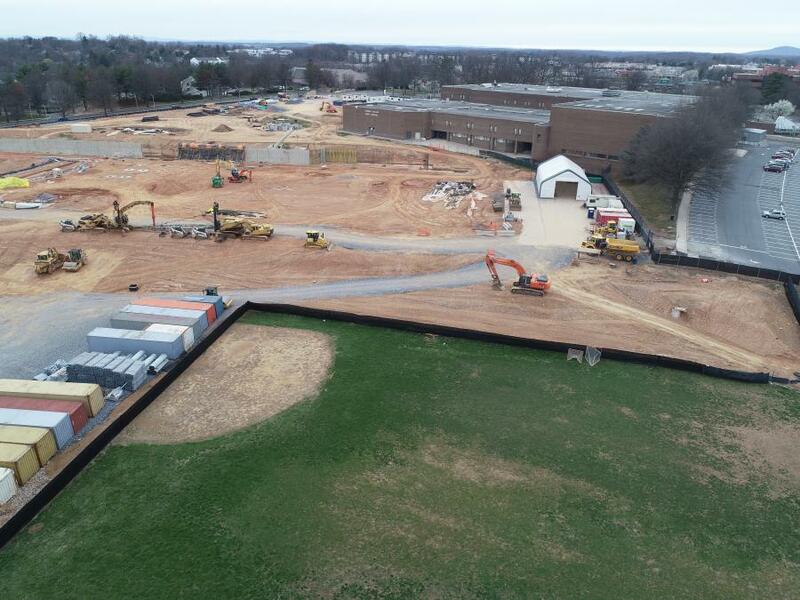 Gary Mosesman, facility manager/architect of the MCPS Division of Design and Construction, reported that the main challenges with this project have been building a new school beside the occupied school and working around the tight site conditions. The flexible building design for the school will accommodate current and future high school programs and delivery models. A philosophy of adaptable classrooms will facilitate various presentation formats and learning activities. Multipurpose and flexible spaces were designed that can be used by both staff and students to collaborate on projects. Furniture that is easily reconfigurable will be used to maximize the flexibility in the school. The site topography is defined by three terraced levels, with the existing school, staff and student parking, bus access and student drop-off occupying the majority of the uppermost terrace. The basketball and tennis courts, stadium, running track and baseball, softball and soccer fields are located on the middle and lower terraces. The replacement building will predominantly occupy the middle terrace. New athletic fields will be terraced in, along with staff, student and visitor parking and a student drop-off loop. Two additional parking areas will be added along the southwest side of the school. Onsite staging areas will be included for 30 buses, 439 parking spaces, and onsite student drop-off queuing for 30 cars. All existing utility services and connections, including water, sewer, gas, electric, telephone and telecommunications, will be upgraded to support the needs of the replacement building. The new water service will be sized to supply the required onsite fire hydrants and to meet the building's fire protection and domestic supply needs. All upgraded and new service connections will be made to the existing utilities in roadways adjacent to the site. 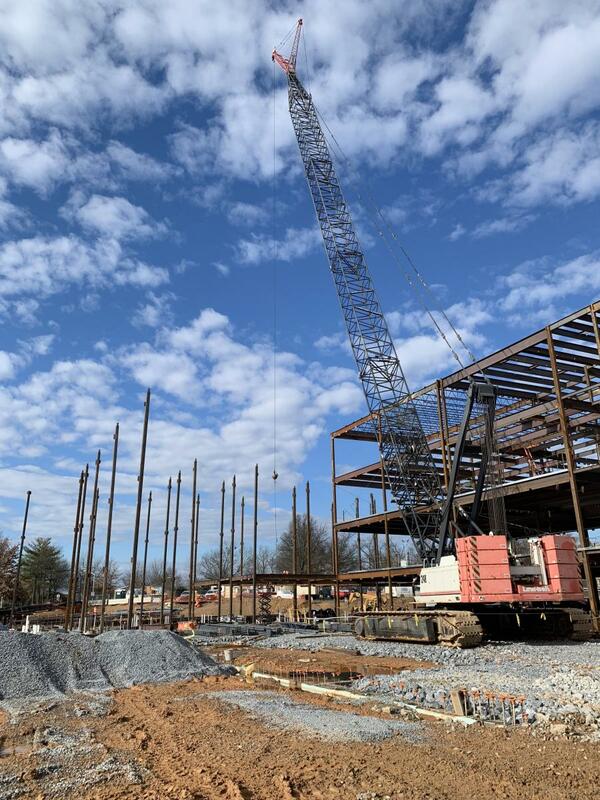 The replacement building, designed to meet MCPS educational specifications, will be a steel-framed structure with brick veneer and masonry interior walls. The building will include two main sections: a three-story classroom wing and a two-story public wing. The public wing will house the auditorium, athletic facilities, and the student dining room. The instructional media center, athletic facilities, and auditorium will be available for after-hours use, while the remainder of the building remains secured. The administrative suite located at the main entrance to the building will incorporate a securable glass vestibule that requires all visitors to check in at the main office before entering the school. The main entrance to the school will be visible from Middlebrook Road and Crystal Rock Drive. The academic wing will be organized around two large courtyards that will provide natural light to interior classrooms and provide efficient, conveniently monitored interior circulation. A three-story master-planned 17-classroom addition was included in the design to accommodate future growth. The visual impact of large expanses of masonry will be reduced with window fenestrations, shifting building volumes, and by varying architectural exterior finishes. Varying brick colors, ground-face block, pre-cast concrete accents, and small metal roof canopies will be used to break up the mass of the building. In alignment with the MCPS Environmental Sustainability Management Plan, this project is registered and will be certified for silver or higher rating in conformance with Leadership in Energy and Environmental Design (LEED) certification through the United States Green Building Council. minimizing background noise level from HVAC systems in classrooms and other core learning spaces and control reverberation time with sufficient sound absorptive materials. The replacement building will be heated and cooled by a two-pipe Water Source Heat Pump (WSHP) system. Ventilation for the classrooms will be provided by a Dedicated Outdoor Air System (DOAS). The DOAS will be rooftop-mounted WSHP units with enthalpy wheel style energy-recovery. Offices will be served by variable refrigerant flow systems. The building will include a visitor management system that will provide office staff with the ability to monitor and control visitor access to the school building. A computer-based visitor sign-in system will monitor and track all visitors to the school building. The new school also will have a new building security system consisting of motion and contact sensors at all exterior doors that will be monitored by the MCPS Department of Safety and Security. In addition, a secure entry vestibule will direct all visitors to check in at the front desk before entering the school with a second set of doors always locked during school hours. 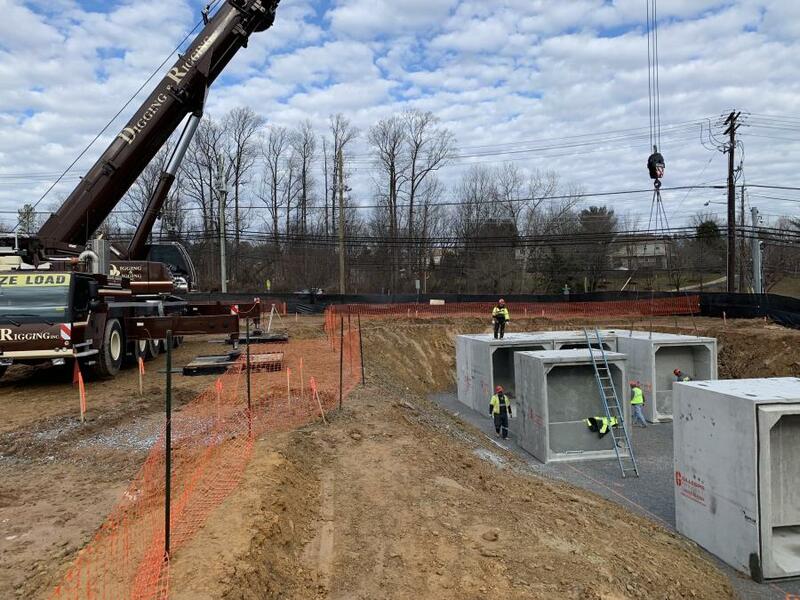 Contractors on the project include the following: Ross Contracting Inc., earthwork and site utilities; Superior Foundations, temporary shoring; TerraSystems, aggregate piers; Pleasants Construction Inc., Clarksburg, Md., demolition, abatement, and IH services; Tobar Construction Inc., Beltsville, Md., site concrete; Kline LLC dba Pleasants Paving, Frederick, Md., asphalt paving; Century Fence Construction, fences, gates, outdoor athletic equipment; Denison Landscaping, landscaping, seed, and sod; Sody Concrete Construction Inc., Timonium, Md., concrete; Bragunier Masonry, Clear Spring, Md., masonry; Kinsley Manufacturing, York, Pa., building steel and miscellaneous metals; Hancok and Albanese Inc., Owings Mills, Md., general trades package; Interstate Corporation, Rockville, Md., roofing; Diamond Engineering, spray applied fireproofing; Zephyr Aluminum, Sykesville, Md., glass and aluminum; Can-am Contractors Inc., Hanover, Md., drywall and ceilings; Atlascopco Construction, tiling; Solara Flooring Group, Clarksville, Md., carpet and resilient flooring; MasterCare Flooring, athletic flooring; Durex Coverings, resinous flooring; SCCP Painting, painting and coatings; Roman Mosaic and Tile, terrazzo treads; Steel Products, Rockville, Md., toilet partitions and accessories, lockers, metal shelving and display cases and boards; Modern Door and Equipment, food service equipment and gymnasium equipment; Pook Diemont & Ohl, stage equipment; Irwin Seating Co., fixed audience seating; TJ Distributors Inc., telescoping stands; Dant Clayton Corp., Louisville, Ky., exterior bleachers; Winandy, greenhouse; ACME Mechanical Contractors of VA, Inc., Manassas, Va., mechanical; Livingston Fire Protection Inc., Hyattsville, Md., sprinkler; and Altimate Electric, Mt. Airy, Md., electrical. Roughly 250,000 cu. yds. of dirt have been moved for the project. Material rough quantities from the project include 2,500 tons of steel; 10,000 cu. yds. of building concrete; and 3,500 cu. yds. of site concrete. The project equipment list includes various loaders, including Cat, Volvo, Case and Bobcat; excavators, including Hitachi, Cat, Liebherr and Komatsu; several Cat dozers, compaction tools; a Cat motor scraper; Volvo off-road trucks; a Lima 50-ton crawler crane; a motor grader; grade-alls; various clearing equipment; a Wirtgen W120F asphalt miller; and miscellaneous trucks.